Why the Anti-gun crowd can’t be trusted and why their arguments fail every time. This is by far the most brilliant article I have seen regarding the anti-gun crowd to date. I’ve shared only a portion of it here. You MUST read the entire thing by Barry Snell here. Gun people don’t trust anti-gun people because they are purposely misleading to rile the emotions of the ignorant. We don’t trust anti-gunners because they say more than 30,000 people are killed each year by guns — a fact that is technically true, but the key piece of information withheld is that only a minor fraction of that number is murder; the majority is suicides and accidents. We don’t trust anti-gunners because we know accidents and suicides don’t count in the crime rate, but they’re held against us as if they do. Gun people don’t trust anti-gun people because suicide is the only human-inflicted leading cause of death in America, and that violent crime has been on the decline for decades. We also know that 10 people die daily in drownings, 87 people die daily by poisoning, more than 20,000 adults die from falls each year, someone dies in a fire every 169 minutes, nearly 31,000 people are killed in car accidents annually and almost 2,000 are stabbed to death. People even kill each other with hammers. Yet fewer than 14,000 people are killed by guns of any kind each year. Gun people don’t trust anti-gun people because not only is the violent crime rate approaching historic lows, but mass shootings are on the decline too. 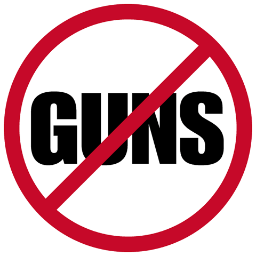 We don’t trust anti-gun people because they fail to recognize that mass shootings happen where guns are already banned — ridiculous “gun-free zones” which attract homicidal maniacs to perpetrate their mass shootings. Gun people don’t trust anti-gun people because school shootings have been happening forever, but despite them being on the decline, the media inflates the issue until the perception is that they’re a bigger problem than they really are. We don’t trust anti-gunners because they’re busy riling up the emotions of the ignorant, who in turn direct their ire upon us, demonizing us because we object to the overreaction and focus on the wrong things, like the mentally ill people committing the crimes. Gun people don’t trust anti-gun people because they look down on us for defending the Second Amendment as vigorously as they defend the First Amendment — a fight we too would stand side-by-side with them on otherwise. We don’t trust anti-gunners because someone defending the First Amendment is considered a hero, but a someone defending the Second Amendment is figured down with murderers and other lowlifes. Where the First Amendment has its very own day and week, both near-holy national celebrations beyond reproach, anti-gunners would use the First Amendment to ridicule any equivalent event for the Second Amendment, like they did for a recent local attempt at the University of Iowa. Gun people don’t trust anti-gun people because anti-gun people put us down with dismissals like “just another dumb redneck with a gun.” We are told all over the Internet that we deserve to be in prison for being awful, heartless people; baby-killers and supporters of domestic terrorism, even. We don’t trust anti-gun people because even our own president says people like me are “bitter” and “cling to our guns and religion.” One need only go to any online comments section of any recent gun article in any of the major newspapers to see all this for themselves. Gun people don’t trust anti-gun people because they seek to punish us for crimes we didn’t commit. We don’t trust anti-gunners because we know that the 100 million of us are peaceful, law-abiding citizens who love this country and our society as much as the next liberal. Yet when one previously convicted felon murders someone with a stolen gun five days after his release from prison, or things like the Newtown shooting happen, guns are blamed — and therefore lawful gun owners too, as there is guilt by association, apparently. Gun people don’t trust anti-gun people because when things like the Boston Marathon bombing happen, everyone correctly blames the bomber, not the bomb. Nobody is calling for bomb control because killing people with bombs is already illegal — just like killing people with guns is illegal too.